James Collins of Luton Town. JAMES COLLINS FEELS he has done everything in his power to earn a first senior Republic of Ireland call-up ahead of this week’s squad announcement. On Thursday, Mick McCarthy will reveal his panel of players to face Gibraltar and Georgia in Ireland’s opening Euro 2020 qualifiers, which are scheduled for 23 and 26 March respectively. 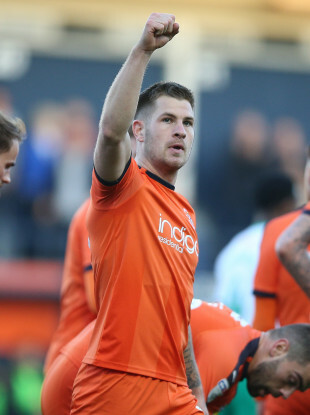 McCarthy was at Kenilworth Road on Saturday, when Collins scored his 20th goal of the season in Luton Town’s 2-0 victory over Rochdale, which kept the Hatters five points clear of Barnsley at the top of League One. The Ireland boss said afterwards that the 28-year-old striker — the division’s leading goalscorer — “has a real chance” of being included in his squad for the double header. “I don’t think I could do much more,” Collins told the local press in Luton when asked about his prospects of being selected by Ireland. “It’s always been in the back of my mind. They’ve come to watch me a couple of times. “I’ve just kept working hard and not changed too much; doing the right things and trying to score goals. Hopefully that [the goal against Rochdale] will help make his mind up. Collins is a former Ireland U21 international but has yet to be recognised at senior level. The English-born forward is in his second season at Luton, having joined the club in the summer of 2017 from Crawley Town. Should he be included in Mick McCarthy’s squad, he will be unavailable for his club’s League One meeting with Doncaster Rovers, which is scheduled to take place on the same day Ireland’s qualification campaign begins in Gibraltar. Collins said: “I know I’d miss a big game — Doncaster at home — but I think people could forgive me if I do end up going away. Email “A first Ireland cap would be 'the pinnacle' for in-form striker James Collins”. Feedback on “A first Ireland cap would be 'the pinnacle' for in-form striker James Collins”.